Adam, P. C. G., de Wit, J. B. F., Montoya, T. A., Ketsuwan, I., Hamilton, D. S. , & Hardy, R. (2018). 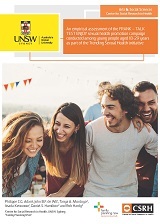 An empirical assessment of the TALK TEST ENJOY sexual health promotion campaign conducted among young people aged 18-29 years as part of the Trending Sexual Health initiative. Sydney: Centre for Social Research in Health, UNSW Sydney. Adam, P. C. G., de Wit, J. B. F., Montoya, T.A., Ketsuwan, I., Hamilton, D.S., & Hardy, R. (2018). 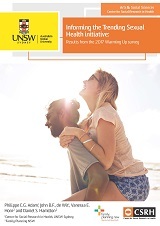 Estimating the coverage of the FRANK sexual health promotion initiative and its contribution to strengthening sexual health-related attitudes and behaviours among respondents of the 2018 Warming Up survey. Sydney: Centre for Social Research in Health, UNSW Sydney. Adam, P. C. G., de Wit, J. B. F., Horn, V. E., & Hamilton, D. S. (2017). Informing the Trending Sexual Health initiative: Results from the 2017 Warming Up survey. Sydney: Centre for Social Research in Health, UNSW Sydney. Family Planning NSW. Feasibility study to establish a national Female Genital Mutilation (FGM) data collection. Ashfield NSW, 2014.